Sharynn’s Quilt Box is proud to announce that we will host a 3-day Handi-Quilter Hands-on Education Event with a Preview Event and Open House. Handi-Quilter Educator, Diane Henry, will be here to conduct this event. Diane is a wellknown Educator and loves sharing her passion for quilting. She has been a professional machine quilter since 2007. 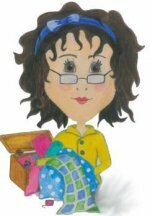 She works with quilting groups and shops leading classes for beginners to advanced quilters. Diane will be here in our shop August 15th (Preview and Open House night) with classes beginning August 16th thru August 18th. August 15th is Preview Night and Open House with light refreshments beginning at 6 p.m. Diane and Darrell will be available to answer questions for anyone who is interested in owning a Handi-Quilter. You do not have to own a longarm machine to attend any of the classes. August 16th is a 3 hour morning class and 3 hour afternoon class on Stand-up Longarm Machine Quilting Basics. August 17th is a 3 hour morning class Fast, Fun, and Fabulous Free Motion Quilting. The 3 hour afternoon class will cover Ruler Essentials. August 18th is a 3 hour morning class on Creative Textures and Fills with the 3 hour afternoon class covering You Can Do That on a Longarm, Too?!!! For information on pricing, please call the shop to register. Space is limited. You do have to register and pay for the classes but the Preview Night is free. If you plan to attend the Preview Night, please let us know as a “head count” is helpful! Also, a new Ruler of the Month Club begins July 1st. Please call the shop to register! !